by the unconscious needs of the moon. with as the real you. ...which you openly express to the world. Is your Sun & Moon Relationship giving you Peace or Tension? We are all under the constant influence of our sun and moon signs. These planets trump everything else in our chart when it comes to their level of influence in our lives. They are the major contributors to what makes us who we are. What's more, by their very nature they are always at odds. They truly represent our internal yin and yang. The drive of our sun and needs of moon are opposing forces. The sun looks for progress and movement while the moon looks for security and comfort. If you have these planets in signs that have similar natures, it makes the relationship between your sun and moon much easier. Conversely, when your sun and moon are in signs with very different natures, a great deal of internal tension is likely. there are between your sun and moon signs. On how many Levels are your Sun & Moon Different? If your sun and moon are not different on any level it's because they share the same sign. There is an internal stability that creates peace within you. There is no internal struggle between the conscious drives of your sun and unconscious needs of your moon because they are the same and in perfect accord. The things you are driven to do are the same things you need for comfort and security. This makes things easy for you. However, because a great deal of your energy is focused on the drives and needs of this one sign, a very narrow focus of energy is created. This limits your ability to deal with things in a variety of ways, and limits your ability to see things from a large perspective. You deal with things and see things primarily through only one sign. Conversely, this narrow focus creates a sharp point, which contains a great deal of power. You may choose to use this to your advantage. However, because of the easy, peaceful nature of this combination, you may never choose to exercise this power. The choice is yours. Your high level of internal peace makes it easy for you to express the best qualities of your sun and moon sign. You rarely express their worst qualities. 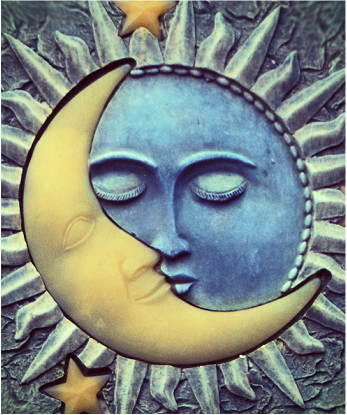 You sun and moon are more similar than they are different. Because they only differ on one level, you experience internal peace. For the most part, your sun's drives are the same as your moon's needs, making it easy for you to satisfy yourself without having to focus your energy in many different directions. However, because your sun and moon are so similar and operate differently on only one level, you also have a relatively narrow perspective and don't have a great ability to deal with things in a variety of ways. Your internal peace allows you to easily express the best qualities of both your sun and moon signs. You don't express the worst qualities often. Your sun and moon differ on two levels, which means they only have one level in common. So, for the most part, they are pulling and pushing you in different directions. This dynamic causes inner tension. You often have mixed messages coming from the drives of your sun versus the needs of your moon. However, these differences widen your focus and give you a wider array of tools to use in dealing with the world compared to those combinations on the 0 or 1 levels of difference. You trade some peace for a wider perspective and more diverse expression of energy. Your internal tension causes a tendency to express the worst qualities of both your sun and moon signs. At times, effort is needed to make yourself express the best qualities of these signs. Your sun and moon are completely different on every level. The drives of your sun are always pulling you in a completely different direction from the needs of your moon. This creates internal tension because you are always being pulled or pushed in two different directions. However, there is great potential for power with these combinations because you have the widest focus of energy and therefore you have the widest array of energies at your disposal for dealing with the world. From the tension and wide dispersal of energy can come great achievements if you choose to accept the challenge and use it to your advantage. The great tension between your sun and moon signs makes it easier for you to slip into expressing the worst qualities of both your sun and moon sign. You often find that you have to work at expressing the best qualities of these signs. If your sun and moon are in the same sign, you have the most narrow focus of energy because all of your sun and moon's energy is focused on the qualities of that one sign. If your sun and moon are in signs with completely different qualities, you have all of these different qualities and their energies to work with. A greater number of differences between the energies of your sun and moon give you a greater variety of energies to use in your life. Although it does cause tension, because the energies are often caught in a tug of war, you still have more different energies available to you. If you have very few different energies, you have great peace. If your sun and moon are in the same sign, you have only the energies of that sign, but you have great internal peace. Regardless of the existence of any aspect between your sun and moon, these planets are in certain signs. So even if your sun and moon don't form an aspect between each other in your chart, you are still experiencing your sun's drives through its sign and your moon's needs through its sign. If these signs are very different in their nature, you will feel a tension between them. If they are in the same sign or in signs that are similar, you will feel peace with little to no tension.